So, a long jaunt up Highway 191 (from the Painted Desert and Petrified Forest) took us past the huge Utah welcome sign and then onto highway 163 where a surprise sign at mile marker 16, drew our attention. The sign shows the spot where Forrest Gump (Tom Hanks) stopped running in the 1994 Forrest Gump movie. After a brief stop at the Forrest Gump sign, we moved swiftly on because Monument Valley was now well visible on the horizon and was calling to us to get there so we could spend the rest of the afternoon exploring it. Monument Valley or in Navajo, Tse Bii’ Ndzisgaii, (no, I can’t pronounce that) is an area of sandstone buttes reaching up to 300 metres in height from the Colorado Plateau in a Navajo Nation Reserve. The bright red colour of the buttes comes from iron oxide exposed by weathering on the surrounding siltstone. Access to some of the best buttes is through the Monument Valley Tribal Park with an entrance fee to pay and then a 17 mile dirt track road winding its way through the amazing valley on a 2 – 3 hour road trip. Well, what can I say? This was easily the most amazing part of our trip so far and well worth the extra long drive we had to make to get there. Even the girls were awe struck by our surroundings. The sheer scale of the place was just unbelievable and by following the map given to us at the park entrance we were able to identify the different buttes and mesas such as the Totem Pole, Elephant Butte, West and East Mitten Butte amongst so many others as we drove through the park. There are various stages of erosion, by wind and water, demonstrated in Monument Valley with the mesa’s being the first stage. Mesa meaning table in Spanish and is a rock formation that looks like a table. A mesa is usually wide, stable and is the first stage of erosion. The next stage of erosion is the butte (pronounced bee-ute). These are formations that have been eroded from a mesa to a second stage of erosion to form a smaller formation. Spires are the last stage of erosion from a butte that has been eroded into a narrow and free standing spire such as the Totem Pole. 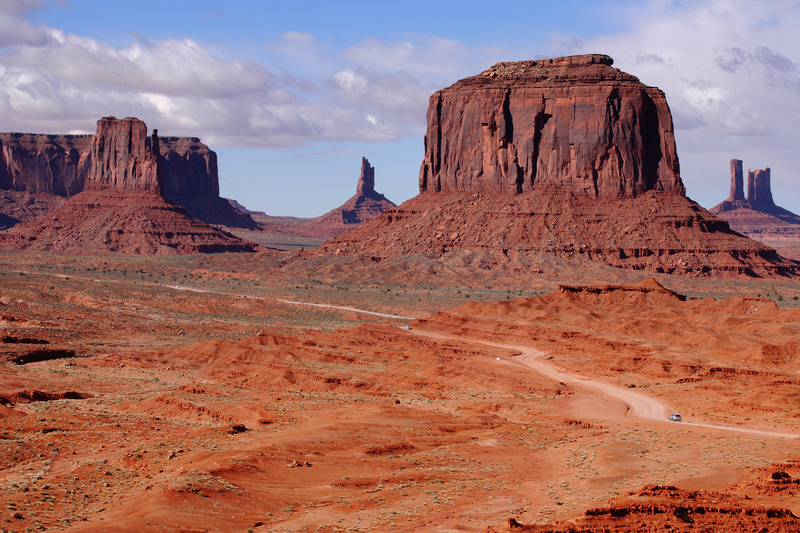 Many films have been made at Monument Valley, particularly starring John Wayne and directed by John Ford. At John Ford Point is a view over the valley towards West and East Mitten Buttes and Elephant Butte, called John Ford Point, supposedly the place of John Ford’s favourite view. It is beyond doubt, a pretty epic view point! More recently a memorial has been placed there which commemorates the death of a local Indian killed in the Iraq war. Every pull in spot along the 17 mile drive was taken advantage of by us and our cameras and was well worth the stop. We were spell bound the entire way round by the majesty and magnitude of this spiritual, yes, it really felt spiritual, place. In fact words feel quite useless in describing Monument Valley– if you ever get the chance to visit, take it, you’ll never regret it. Even after we’d finished our entire trip, Monument Valley was top of our list of favourite places and so well worth the extra effort to get there. We stayed in Gouldings Lodge just outside the Navajo Tribal Park but with awesome views over more mesas and buttes in the distance and sheltering under its own mesa directly behind it. Gouldings was a great place to stay; compared to some of the slightly more budget motels we’d stayed in, Gouldings felt like a little bit more luxury than we’d sometimes had, but we only had one night there before it was time to move on again and head for the Grand Canyon. Our route to the Grand Canyon took in a surprise tourist attraction with hand painted signs on the side of highway 160. An attraction that we nearly drove past but decided at the last minute we should stop at – after all, when we were ever going to be there again? So, what was this surprise attraction? We were so glad we did stop, this attraction was also epic – it was up there with our top favourites of the entire trip! What was it? You’ll have to wait till my next blog post to find out!